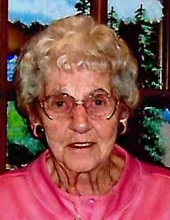 Cecelia S. Schneider, 101, formerly of Fond du Lac passed Thursday, February 7, 2019 at Villa Loretta Nursing Home in Mount Calvary. She was born November 20, 1917, a daughter to the late John and Emma Sabel Pickart. She married Alex A. Schneider on January 19, 1937 in Marytown. Alex passed away in 2005. Cecelia and Alex owned Schneider Roofing and Siding Company and then purchased and operated Pickart Radiator Shop in Fond du Lac, until retiring in 1980. She was a member of St. Patrick’s Altar Society and a member of both Holy Family Parish and St. Isidore Parish. Survivors include two children, Barbara Heinle of Middleton, OH, and Mary Lang of Phoenix, AZ; one daughter-in-law Arlyn Schneider of Fond du Lac; 9 grandchildren, 18 great grandchildren, 7 great great grandchildren; nieces, nephews, other relatives and friends. She was preceded in death by her husband, Alex, one son LeRoy Schneider, two sons-in-law Craig Heinle and Bill Lang, two sisters Loretta Lisowe and Viola Burg, and two brothers Franklin Pickart and Claude Pickart. Cecelia’s family would like to extend a special thank you to the staff and volunteers at Villa Loretta. They made the last 6 years of Cecelia’s life feel like she was at home. The family also thanks all the staff of Agnesian Hospice Hope for their care and compassion. In lieu of flowers, donations can be made to Villa Loretta Nursing Home or Agnesian Hospice Hope. Visitation: Visitation will be held at St. Isidore Catholic Church in Mount Calvary on Tuesday, February 12, 2019 from 10:00 to 10:45 AM. Services: A Mass of Christian Burial will be held on Tuesday, February 12, 2019, 11:00 AM at St. Isidore Catholic Church. Rev. Gary Wegner, O.F.M. Cap. will officiate. Burial will be in St. Charles Cemetery. "Email Address" would like to share the life celebration of Cecelia S. Schneider. Click on the "link" to go to share a favorite memory or leave a condolence message for the family.